There is one flower in that picture in focus. Really. I just can't help playing with depth of field. One of the effects of the good weather, starting so early, having all the time in world etc etc is that I have no excuse to skimp on ground preparation and doing things properly. Doing things properly is hard work. Today I thought I'd make the climbing bean bed ready. Just rake out the weeds, dig some trenches, fill them up with compost and set the poles. Easy peasy. It's taken me hours and I'm so tired I was falling asleep in front of the fire just after dinner. Digging is hard work. The bed is still not finished, I have to cover the compost and put up the poles yet. That nice fork in the foreground is new and a good tool. 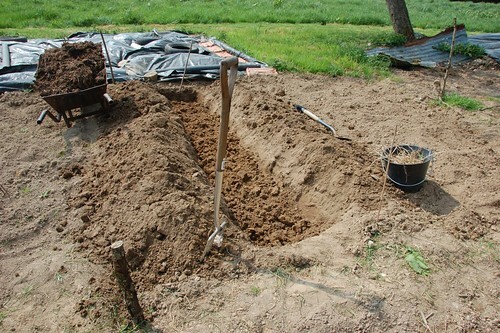 I used it to break up the subsoil before adding the compost and grass clippings. Note also the bucket of couch grass extracted from a spit down. This is effectively just two rows of double digging per trench. At least one school of thought would have me double dig the whole plot every few years and that would improve the soil. At my rate of digging that's never going to happen so my usual half-arsed approach will persist. I know there are many proponents of permaculture out there who would like to put me straight but please, bring wine round on a Saturday afternoon and we'll discuss it then if you must. Any form of permanent bed system would, with my lousy housekeeping, descend back to nature in no time at all, and that would be too depressing. 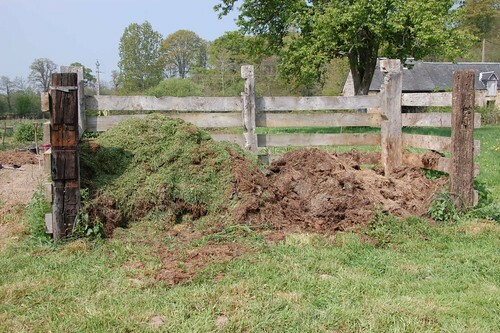 At least the compost bin is working well, although turning it is more of that hard work. 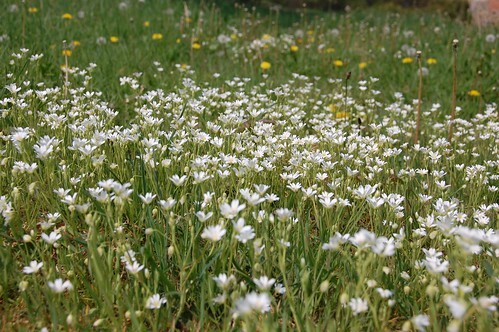 Love the photo of the field flowers. And digging is hard work, but it's magic for working up a good appetite!